The University Networking & Infrastructure Department at ITS offers online Work Order Submission & Tracking System available to LSU Faculty & Staff. When to Submit a UNI Online Work Order? How do I Log in to the Work Order System? How do I Submit a New Work Order? How do I Check the Status of an Existing Work Order? How do I View the Work Order Items that have been Added by an Analyst? The initial screen will contain General Instructional Information along with any current news we think will benefit you. This process will walk you through Beginning & Submitting a new work order into MySoft. 1. Click Add New... at the bottom left of the screen to create a new order. Work Order Nbr: This is an auto-generated field that is read-only. Request date of Completion: Select the date you would like this order to be completed. Please note that this does not guarantee that the order will be completed by this date. You can only input a date in the future. MIXED – Data & Voice. Use this type to request new voice and data services simultaneously. This request may require additional hardware and wiring. NASA – Network Application & Systems Architecture. NEA – Network Engineering and Architecture. Use this type for network upgrades, IPv4/IPv6 network design specifications, wireless network estimates and additions, VPN requests, network virtualization/SDN research, and grant partnership inquiries. NICEL – Cellular Communications. Use this type to request new, replacement or plan changes for cellular phones and monthly plans. NICS – MySoft Customer Service. NIDC – Data Center. Use this type to add/remove/move equipment to the Data Center, or request power, cooling, fiber or copper connections to a rack. NIDI – Data/Network Connectivity. Use this type to request activation or deactivation of existing network ports, ONLY where wiring exists. NIDI Install – Data Installation. NINF – Network Facilities. Use this type to request new fiber circuits, fiber cable, telephone cable and any other "outside plant" cable needs. NIPG – Pagers. Use this type to request new pager services. NISE – Software Engineering. Use this type to request access, changes to configurations or new configurations in IPControl (IPAD), DHCP, DNS, Network monitoring system (NMS) and network graphing. NITV – Cable Television. Use this type to request new or changes to existing cable television services. NIVC – Voice. Use this type to request telephone services including phone line adds, moves and changes ONLY where wiring exists. Also use this type for voicemail or modular messaging adds, moves or changes including mailbox passwords. Description of Work to be Done: Explain in detail what is needed for this Work Order. Client Attachment: You may attach a file to this Work Order to help further explain details that may help our analysts. Contact Info From User: The Contact is the user we will refer to for information and work to be done on this Work Order. The Contact may be the actual customer or it may be just a person who has been assigned the task of procuring the Work Order Item Request. User Information List: This screen is used to select a Work Order Contact. You may search for users by: User ID (PAWS ID); Directory Number; OR Name. Once you have found the user, double-click the entry to return to the Work Order submission screen. Contact Name, Phone, Email: These fields will be auto filled when you select the contact info from the user table. Double-click on the Existing Order found by your search criteria. One-Time Debit Source: Input the budget code for the one time charge of this Work Order. It must be a 9 digit code and can not end in "89". Monthly Debit Source: Input the recurring charge if appropriate for this Work Order. It must be a 9 digit code and can not end in "89". Status: Current Status of this Work Order. Date Received: Date you Entered the Work Order. Date Completed: Date the Work Order was Closed. Open Items: Total Number of Open Work Order Items. Closed Items: Total Number of Closed Work Order Items. Canceled Items: Total Number of Canceled Work Order Items. Total Items: Total of All Work Order Items, Regardless of Status. Print: Allows you to Print the details of this Work Order for your own viewing pleasure. 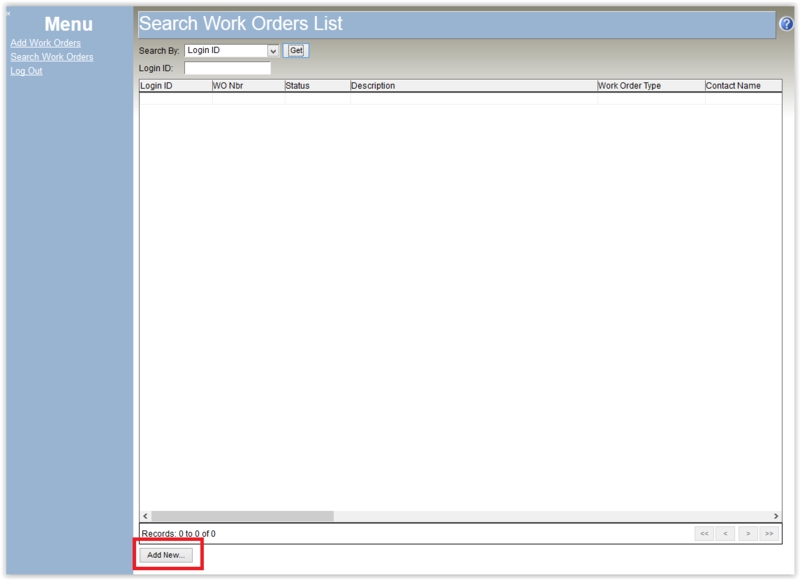 Copy WO: You can fill out the details of an order and then press this button to copy all contents to a new Work Order. This is convenient when you have multiple orders to submit with only small changes in the detail, such as contact information. Exit: Exit this Work Order without saving. Submit: Submit this order to our Work Order queue. You will receive an email confirming that the submission was successful. Once you submit, you will not be able to change any fields. If you find a mistake, please contact the Help Desk (578-3375) to either have the ticket canceled or have a field changed. After an analyst makes contact with you, you make also ask them to change details to the order. WO Items: Only available after you submit the Work Order. This allows you to follow the progress of the analyst working on your order. The Work Order will be updated as progress is made. 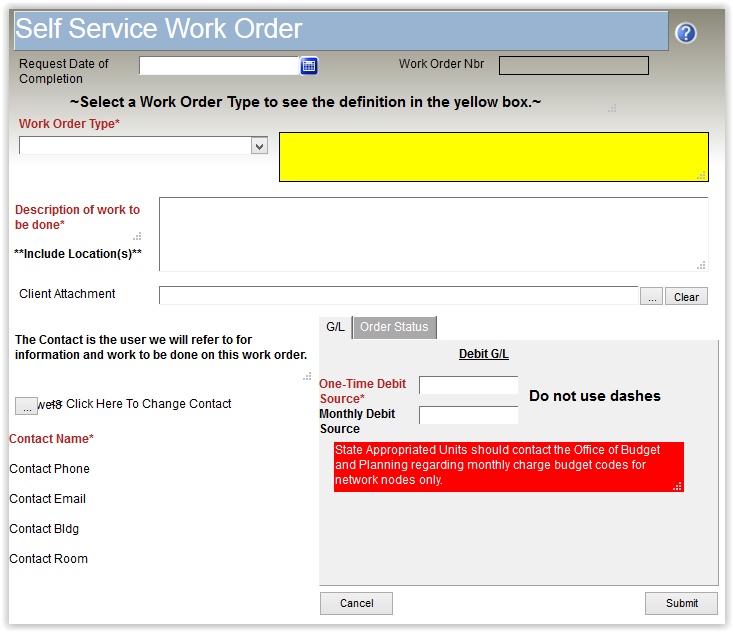 This screen lists the Work Order items added by the analyst working this order. Double-click on an item to view details of this item. Once the Work Order is Completed & Closed, you will be sent a follow-up email indicating that order is now closed. You will also be asked to return to the order to complete a customer satisfaction survey (ONLY ONE Question). This is completely voluntary and will greatly help us continue to improve on our customer service approval.